Defender of the Flame is about the first steps toward the next phase of human evolution -- the development of so-called "paranormal" powers such as ESP. Starship pilot Terry Radnor's life is transformed by the discovery that he possesses these powers, and that others are working to spread them throughout the worlds of humankind. But they face danger. Most people don't want to know that such powers exist; they have a deep innate fear having to admit that their conception of reality is false. And some of those people will go to any lengths to suppress their emergence. Some will even resort to terrorism. Terry vows to defend the world that is spearheading the spread of new human capabilties, a world where for the first time in his life he has found happiness. He has no idea of how far that aim will take him from everything else he cares about -- his promising career as a Fleet officer, his wife and soulmate, his unborn child. Torn away against his will, he is forced into exile from all that has previously mattered to him, seeing no chance to fulfill the commitment he has made. Yet a mysterious and extraordinary destiny has been predicted for Terry, and fate leads him to an even stranger one than anybody could have imagined. 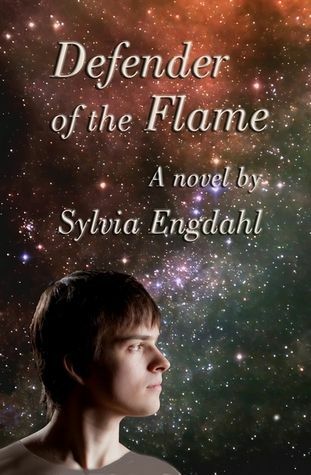 This is the first book in the Rising Flame series, to be followed soon by Herald of the Flame. It does not depend on having read the Hidden Flame series, which precedes it, since although set in the same world it is a separate story, complete in itself, that takes place 200 years later. People often ask why I chose to write science fiction. First of all, let me say that although my novels are set on future or hypothetical worlds and therefore have to be called science fiction, they are not typical of that genre and generally appeal more to people who read little if any other science fiction than to avid sci-fi fans (although there are exceptions, of course; some science fiction enthusiasts love them). As I’ve often said, I hate the “genre” system, which labels books in such a way that they will never be discovered by readers who don’t look at listings for genres they don’t usually enjoy. Formula fiction is easily categorized by genre, but when a writer directs a book to a wider audience than people who are seeking stories that fit a particular formula and who dislike departures from it, a forced genre classification does nothing but harm. My novels don’t fit the usual requirements of the science fiction genre. They are not action/adventure stories. There’s nothing weird in them; they are not “far out” enough to suit the tastes of readers with an extensive background in sci-fi. On the other hand, there is little if any science. While I don’t violate known scientific fact with respect to near-future settings, when it comes to the distant future I use familiar ideas, such as faster-than-light travel, without offering a made-up explanation for it that is no more factual than the simple assumption that interstellar travel by means presently unknown to us will someday exist. I describe extraterrestrials as very much like us, not because I don’t realize that they are probably not at all like us, but because anything I might imagine would be no closer to reality than portraying them in a way that encourages reader identification with the characters. My aim is to express views of life that I believe are timeless and universal apart from the specific setting of a story, and since I am not writing fantasy, I feel that artificial, fantastic details are distracting. So if I don’t want to conform the conventions of the science fiction genre, why do I write about the future? For two reasons: first, the idea of a universe filled with countless inhabited worlds (an idea that was believed by almost all educated people in the 18th and 19th centuries, long before its recent revival by science) has always fascinated me. And second, because I believe that how people in our era think about the future is important. The expansion of human civilization into space is, my opinion, vital to our future survival; this has been one of my deepest convictions for nearly sixty years. I have little sympathy either with doomsayers who maintain that we are headed for catastrophe or with the notion that Earth is the only place of value and that it can remain isolated from the rest of the universe. Furthermore, I feel that it’s harmful to view extraterrestrials either as evil aliens likely to invade our planet or as “gods from outer space” who will arrive to give us all the answers and save us from ourselves. None of these views foster constructive efforts to solve our world’s problems, and they lead to a negative conception of our place in the universe that distorts the outlook of young generations. And so I attempt in my novels to combat them. Above all, I want readers to look toward the future with hope, in the belief that however difficult our problems, and however slowly our species evolves, humankind will continue to move forward. Our world is one small part of a vast, wonder-filled universe that we will sooner or later encounter. People need to think of it in that light. Sylvia Engdahl is the author of ten science fiction novels. She is best known for her six Young Adult novels, which are also enjoyed by adults; Enchantress from the Stars was a Newbery Honor book, winner of the 1990 Phoenix Award of the Children's Literature Association, and a finalist for the 2002 Book Sense Book of the Year in the Rediscovery category. The others, including the Children of the Star trilogy, are for older readers, and her most recent novels -- Stewards of the Flame, Promise of the Flame, Defender of the Flame, and the forthcoming Herald of the Flame -- are for adults. She has also recently published an updated and expanded edition of her nonfiction book The Planet-Girded Suns: The History of Human Thought About Extrasolar Worlds. She is a strong space advocate and has maintained a widely-read space section of her website for many years. From her home in Eugene, Oregon she works as a freelance editor of nonfiction anthologies for high schools.